A passive component designed to resist changes in current. Inductors are often referred to as "AC Resistor". 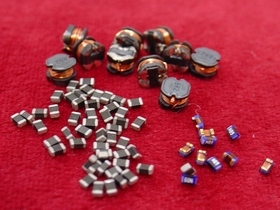 The ability to resist changes in current and the ability to store energy in its magnetic field, account for the bulk of the useful properties of inductors. Current passing through an inductor will produce a magnetic field. A changing magnetic field induces a voltage which opposes the field-producing current. This property of impending changes of current is known as inductance. in the communication, such as cellular phone, paggers, television tuners, radios, frequency, better Q factor, and much stabler performance. ◇ Excellent solderability and resistance to soldering heat. ◇ Suitable for flow and reflow soldering. ◇ Good dimensions, high reliability, and easy surface mount assembly. ◇ 3 types of materials provide wide range of inductance value for flexible needs. in the communication, computers, digital and other information system prodcuts. ◇ A closed circuit formed by internal silver printed layer, acting like a magnetic shield, minimizes heat generation and cross-talk. ◇ Nickel barrier termination makes the part suitable to use at either wave or IR soldering process. ◇ Easy to use, serial connection to Signal/Power lines for noise limiting prupose. ◇ 3 types of materials provide wide range of Impedance value for flexible needs. in digital camaras, PDA, netebooks, PC's LCD TV Sets, DC/DC converters, and other electronic devices. ◇ High reliability and easy surface mount assembly. ◇ Wide range of inductance values are available for flexible needs. ◇ Consisting of 0302, 0403, 0504, 0702, 0703, 0705, 1004, 1005, 1006, and 1008 sizes. notebooks, PC's USB, HUB, and etc. The wire wound features advance in lower DC resistance and higher current tolerance, and much stable performance. ◇Good dimensions, high reliability, and easy surface mount assembly. ◇ Consisting of 0805 and 1206 sizes..